The exuberant, exhilarating photographs of dogs underwater that have become a sensation From the water's surface, it's a simple exercise: a dog's leap, a splash, and then a wet head surfacing with a ball, triumphant. "Now we know exactly what to put on our holiday wish list!" -- pawnation.com "Different from anything you've seen before." -- CNN.com "Dogs expressing their graceful and goofy selves while swimming." -- vetstreet.com "Alternately humorous, rejuvenating, and even a little scary, these pictures of man's best friend in man's most essential liquid make us wonder why someone didn't think of taking pictures like this sooner." -- Complex.com ..". it's the gleeful images of dogs plunging into swimming pools, chomping after their favorite toys, that have put Casteel on the map as one of this country's premier - and innovative - pet photographers." -- petsugar.com "It's impossible to look at Under-water Dogs without smiling.... A delight-inducing book." -- BookPage "These aqua-doggies are guaranteed to bring a smile to almost any face as they become a whimsically single-minded parade of bared teeth and whooshing paws going after the balls and other objects that Casteel tossed into his pool just before clicking away on his underwater camera." -- American Profile "If you're as much of a sucker for great animal photos as I am, you'll love this different take on man's best friend." -- Melanie Stetson Freeman, Christian Science Monitor "Every image in this fetching work bubbles with life, reminding the reader that even in the most lovable and domesticated dog, there may be more primal forces at work." -- Publishers Weekly "The gorgeous, energetic snapshots are special in that they capture our pets in a primal state we rarely get to see." -- Entertainment Weekly's Shelf Life "Seth Casteel's photos of dogs diving into swimming pools in hot pursuit of neon tennis balls have been a sensation." -- Washington Post "These pictures are amazing and sometimes terrifying." -- The New York Times Book Review's "Inside the List" "Surprising and funny." 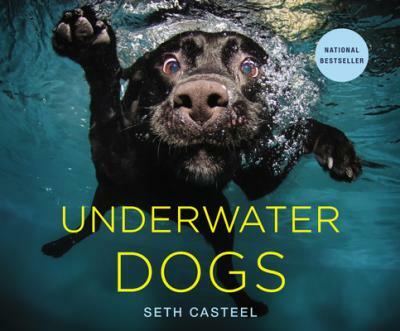 -- New York Times "Photographer Seth Casteel has done an unimaginable thing: he's created an entire photography book of dogs from an underwater perspective, and the photos are simply stunning.... Casteel is not only an animal lover but also an animal rescuer, and his genuine love of dogs shines through in his work." -- Babble Pets "Award-winning photographer Casteel captures his range of subjects with great affection and the variety of expressions and acrobatic poses will keep you chuckling for hours." -- The Daily Mail "The most popular photography book of 2012." -- The San Francisco Chronicle "Alternately gorgeous and terrifying, but always visually sumptuous." -- Entertainment Weekly "Wide-eyed, wet-haired dog portraiture." -- Los Angeles Times "The arresting portraits in Seth Casteel's Underwater Dogs reveal what's happening below the surface. Teeth gnashing, paws paddling, primal and hilarious, these canines bubble with irresistible energy." -- O, The Oprah Magazine "A great coffee table book." -- The Huffington Post Seth Casteel's photographs are "a global phenomenon." -- Wired Included in O, The Oprah Magazine's holiday gift guide, Entertainment Weekly's best-selling gift books list, and The Star-Ledger's holiday gift guide.